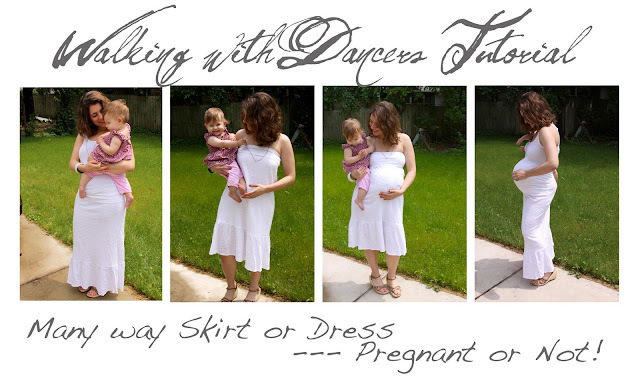 Walking with Dancers: To Maternity...and Beyond!!! Did you read that in Buzz Lightyear's Voice? and I told you not to get rid of the rest of that tank top. I'm about to show you why. We are going to make an adorable wardrobe workhorse. 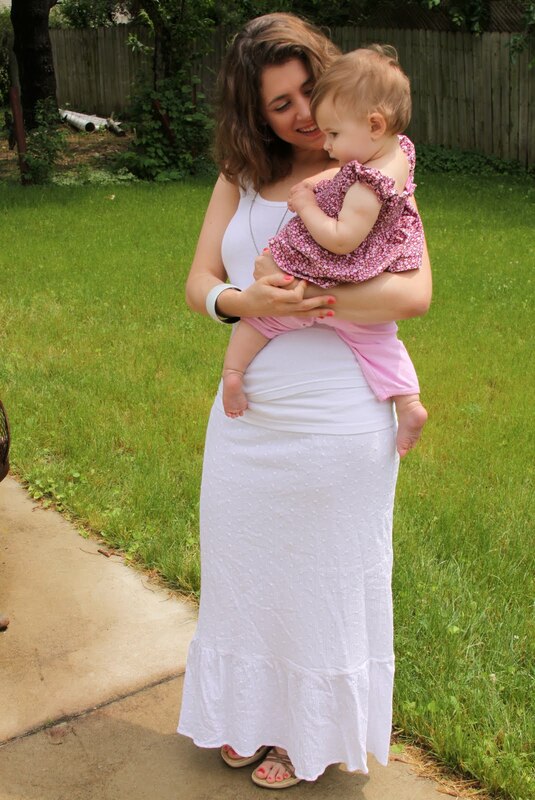 It's an Anytime-Skirt that jumps right on into Maternity. Longer and leaner this time. 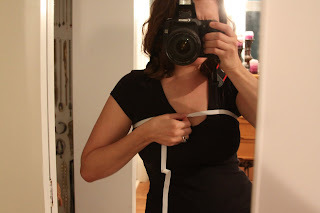 Let's wear it as a maternity dress too! Six Options from one skirt! I've had this old skirt laying around forever. Its elastic had gone bad and didn't work any more. But I didn't want to just shove some new elastic into it. I wanted to give it a new lease on life. To be clear, I'm a little obsessed with clothing that can make it through ALL the size ranges I can possibly muster up, because I've never gone through so many sizes in my life as I have in the past 2 years. And so the less I have to pack away in Rubbermaid bins, just to pull back out in the upcoming years, the better! 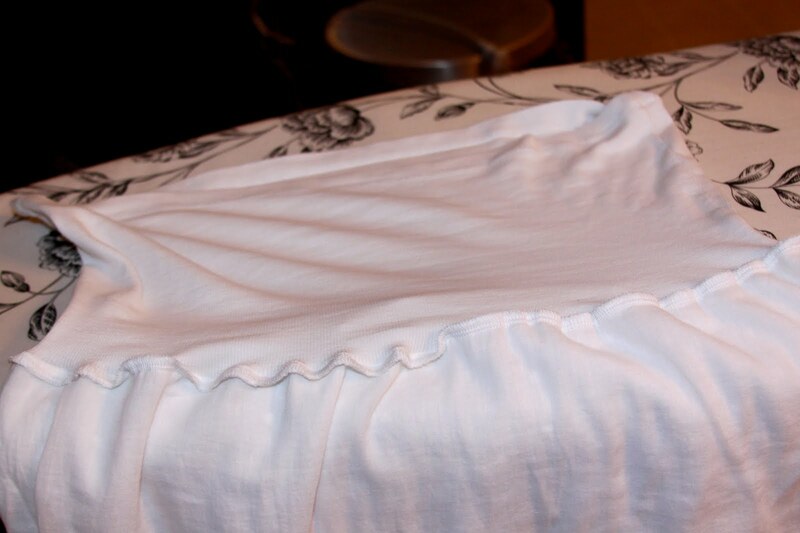 So when I went to make over this skirt, that's what I was thinking. I'm going to show you how to make a piece that really earns it keep. 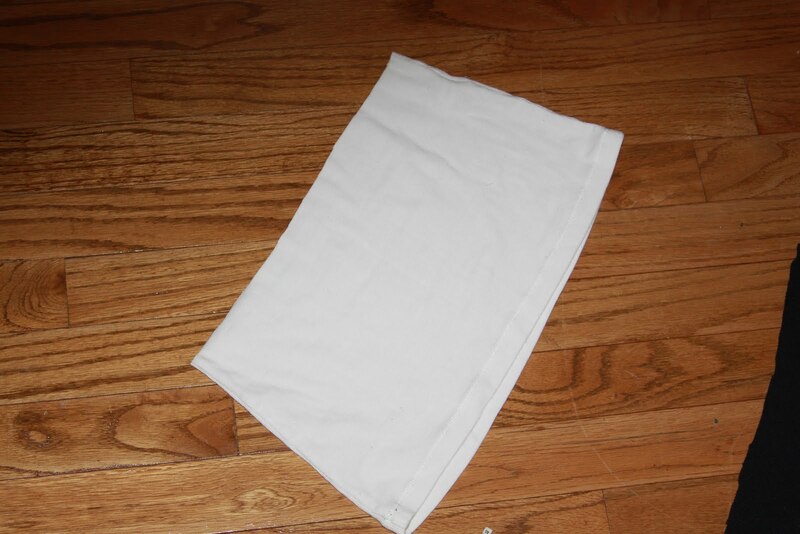 And that left over piece of tank top is just what we need. 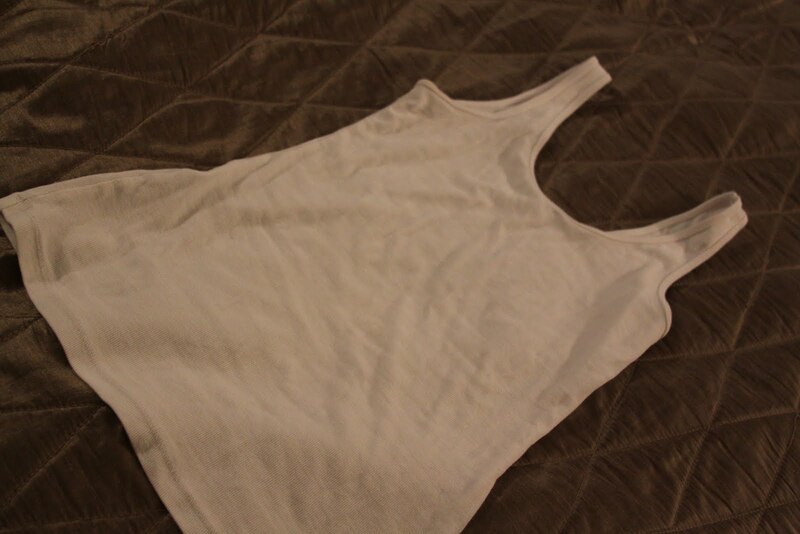 This tank top was 95% cotton 5% spandex. making it really stretchy --- like maternity tank stretchy. So it's perfect for this. You want stretchy! (in essence, where maternity pants go from jean to stretchything). Took it off, and cut it straight across where I marked it. Now to attach the band (aka, bottom of the tank) to it. 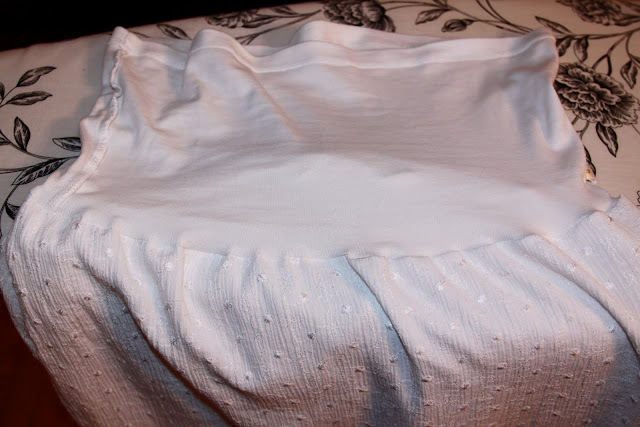 You want the hem of the tank to be right-side-out when the band is folded over the skirt. So place it on like that. Now we need to pin it. The band will be tighter than the skirt (this is good). 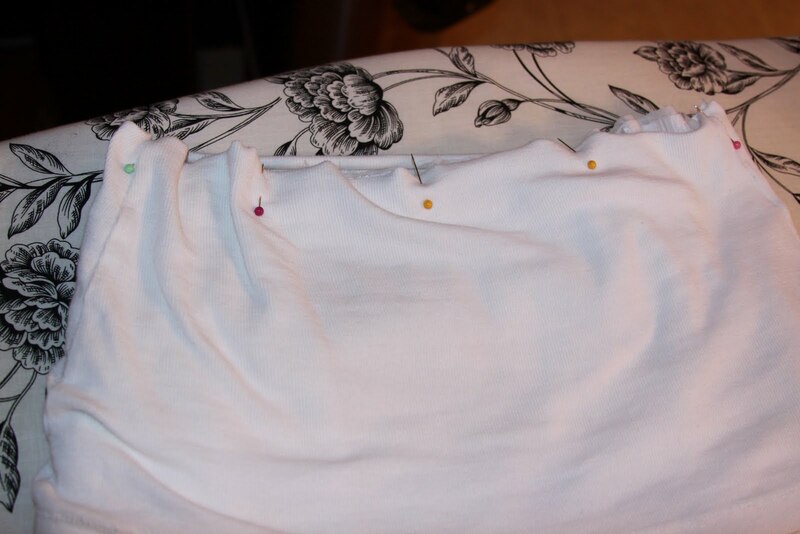 So the way we pin it will be important in order to line up the two different-sized pieces. 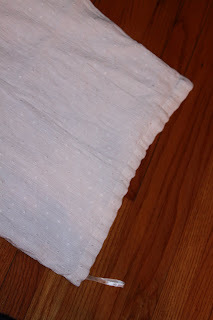 Start by lining up one side seam of the skirt to one side seam of the band and pin it. 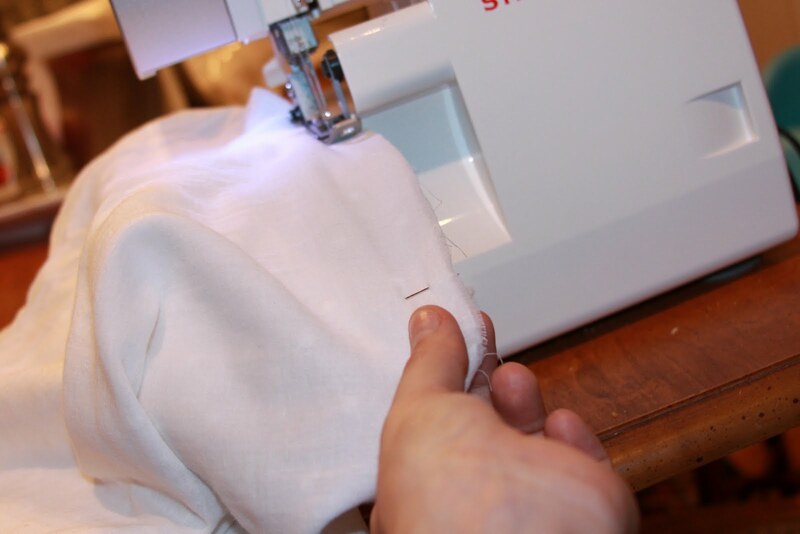 Do the same to the other side seam. 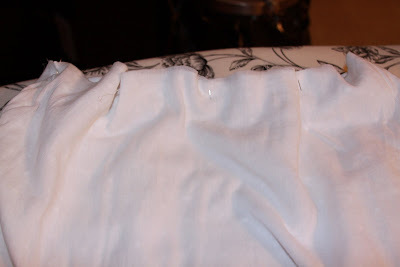 Now find the middle of the front side of the band, halfway between the side seams, and mark it with a pin. Next find the middle of one side of the skirt and pin that spot to the middle of the band that you just found. You might notice that the tank has to stretch a bit to make this work but that's okay, that's what it is supposed to do (so that the stretchy part holds the skirt up). Take this same approach to pin one more spot, half way between the front and the side pins (do this to both sides). You should have 5 pins across the front of the skirt. 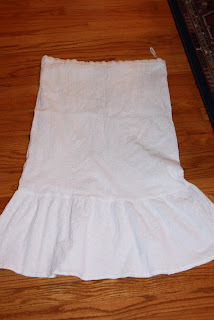 Do that whole process again to the back side of the skirt. Now turn the whole thing inside-out. 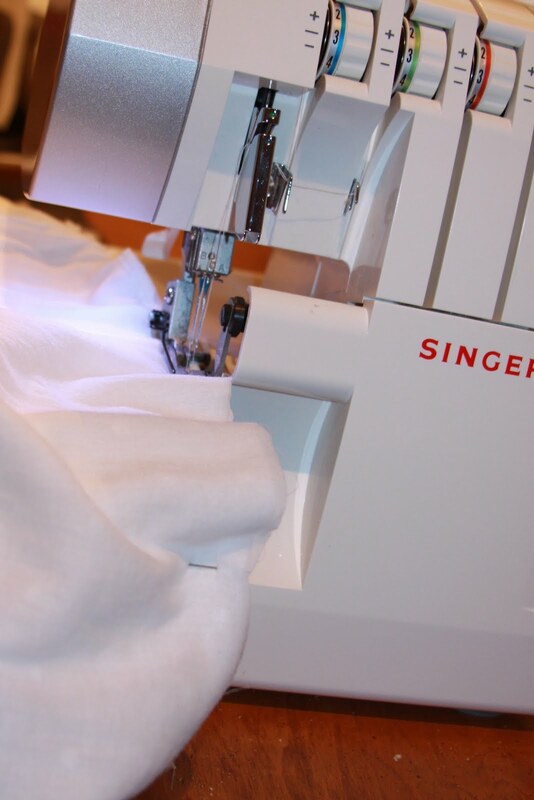 I'll be using my serger. You can see above that since the band is tighter than the skirt, the fabric bunches up. You will need to pull it taught, holding it at each pin, as you go around. Once you go all the way around, you are done! 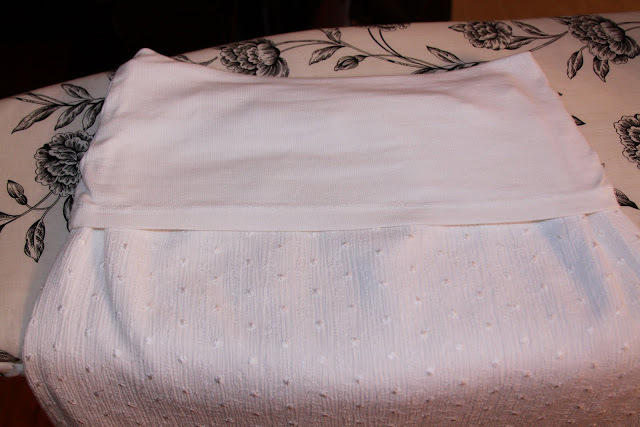 (You can wear it pulled up high as a maternity skirt. 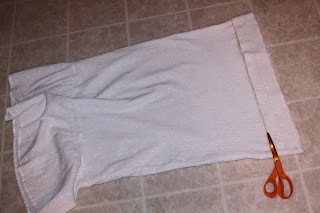 Now one of the first things my husband asked me was, "Is it tight enough up top when you wear it as a dress?" It is a little loose. But I had a solution all made up already. I took a thin piece of elastic and pulled it to where it was snug but comfortable above my bust, cut it, and sewed it closed into a circle. Then I just slide it on over the dress and flip the band over it. Now you know it's not going anywhere. 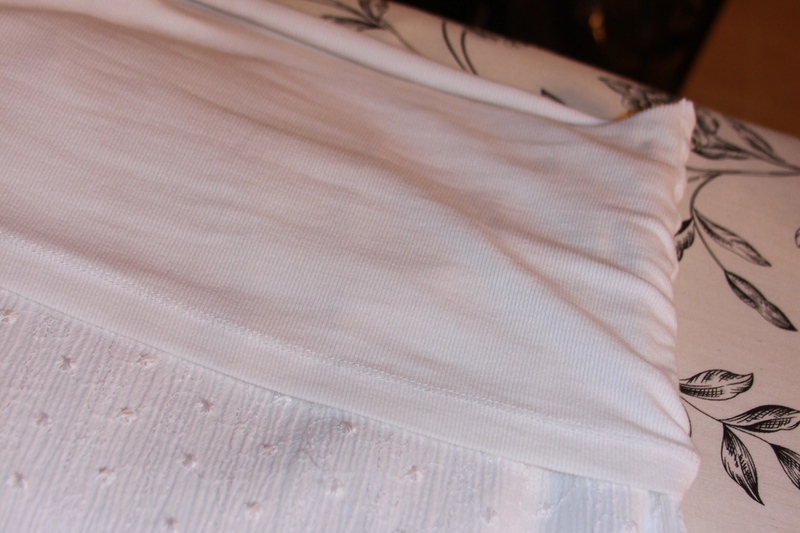 You can also use this band on your waist if you feel like the skirt is too lose when not pregnant. I just found your blog tonight and have now spent like 2 hours on it. (Bad mom moment.) I am in love with this patten for a multi-way to wear dress/skirt. I'm sold. I've got a few skirts that I might transfer now! Love you blog already!